There are lots of great ways to get involved with Dancing the Land Farm. Volunteer for a few days to a few weeks! Come stay with us, learn, grow, contribute, eat some good food, do some good work, make some friends. Come spend a full growing season with us here at Dancing the Land Farm. We're offering two apprenticeships for the 2019 season. An incredible opportunity to learn about sustainable agriculture and life on the farm. Come spend a season honing and expanding your natural building skills all while getting to live and work on a bustling little farm--good food, good people, good work. *Check out our posting on the ATTRA website for more information about our Apprenticeships. 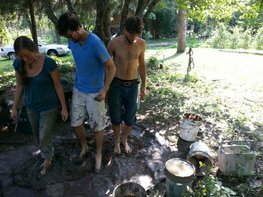 *Click on this link to see our WWOOF profile!